Let me make a confession. Just quietly, I enjoy muscle cars from way back. And, no surprises here, I still enjoy them today. The term "muscle car" is so yesterday. However, not only has the expression stuck, it is really entrenched into performance car folklore. Long live the muscle car! Over the years the muscle cars have become more civilised. In fact, today's muscle cars are really no more than gentle giants ... when in the right hands. But I feel compelled to make the case that muscle cars are not for the inexperienced driver. They have a lot of power and with power comes responsibility. 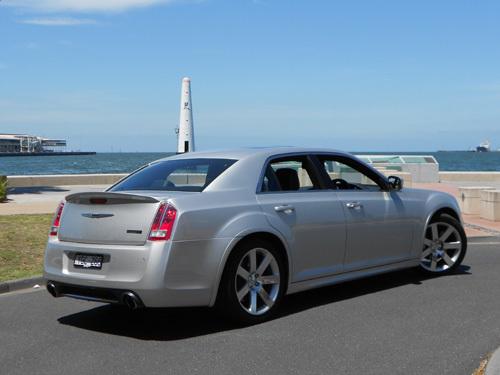 Our muscle car, for road testing on this occasion, is the American-built Chrysler 300 STR8. 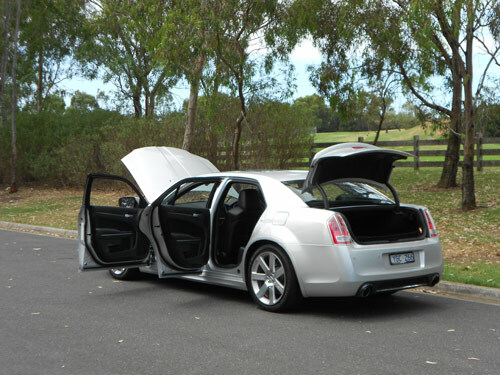 This large sedan comes with enough V8 power to light up your senses. Premium paint and a sunroof were options fitted to the test car. 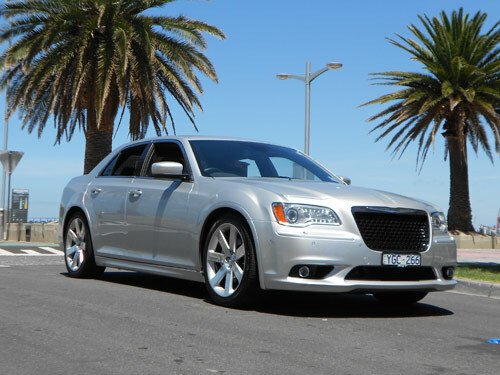 The current MLP* for the 300 SRT8 is from $66,000* without options. Not only does the big Chrysler look good, it is fully satisfying on the road. Sure, it is far more power than you require to undertake a daily commute. But, perhaps, the daily commute isn't the forte of the SRT8. Although the gentle mannerisms of the big 300 SRT8 isn't adverse to continual stop-start motoring, the satisfaction with this car comes from the actual process of driving rather than manoeuvring the long straight stretches of car park (also known as peak hour traffic). However, doing the urban business trips outside of peak hours is quite enjoyable. In this environment you'll hear the occasional burble that only a V8 can provide. Better than a Roy Orbison classic or even the Travelling Wilburys harmonies, the V8 orchestra is music to the ears of muscle car enthusiasts. As mentioned, the 300 SRT8 is a gentle giant as this car is quite easy to manage due to a nice ride and superb braking qualities. The steering is better than what we've come to expect from American sedans. A sign of the times is the fact that the Americans are now serious about playing catch-up with European brands in this respect. It is a clear fact that drivers will enjoy their motoring when the feel from the steering wheel is strong and secure. And that is the way it is with the new 300. 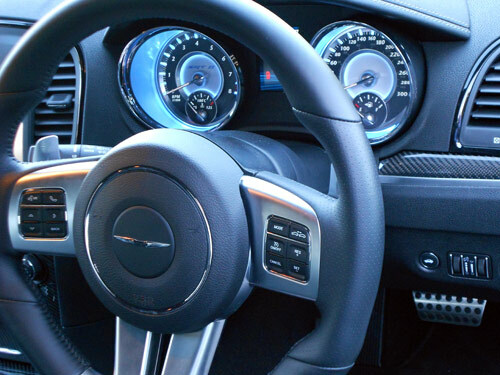 You don't need to justify a thing when you're behind the wheel in a Chrysler 300 SRT8! Space abounds in the big Chrysler. The driver and front seat passenger will enjoy the vast width and legroom, headroom and hip room. There is no compromise with space in this car! The seating is comfy. But one drawback comes about because of the excellent entry/egress capabilities provided by the wide-opening front doors. You see, the front doors open so wide that you have to reach right out to grab the door to close it once you enter the vast interior. Be careful not to fall out is our suggestion (with tongue in cheek). A neat aspect of the two front cup holders is a heating or cooling feature. As we drove the car in summer, we tested the cooling arrangement. We found that the cooler will keep a drink relatively cool but it won't chill a drink that has reached room temperature. So it does the job that it suggests it does, but let me say that the occupants shouldn't expect a refrigerator from a cooler. 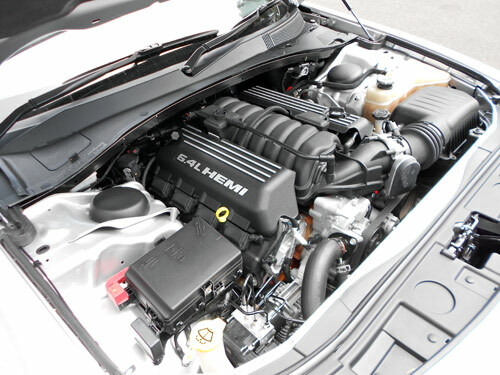 The get-up-and-go factor is provided by a whopping 6.4 litre of hemi V8 excitement. The power is enough, by any measure, at 347kW @ 6,100 rpm. The torque is a bruising 631Nm @ 4,150 rpm. Be assured, these numbers will provide a thrill when you require it. A five-speed automatic transmission is standard. Manual transmission, if you still remember such a thing, is not available in the Chrysler 300 SRT8. Rear-wheel drive completes the drivetrain picture. Seven airbags (including a knee bag on the driver's side), Electronic Stability Control (ESC) with Brake Assist and All-speed Traction Control (ASTC) are part of the safety features included as standard with the Chrysler 300 SRT8. Adaptive Cruise Control system is standard. This particular feature detects a slower moving vehicle ahead and slows the 300 SRT8 in order to maintain a safe distance between the two cars (note: this system doesn't eliminate the risk of collision, but it is good with front to tail type incidents). A collision warning alarm is also included. Blind Spot Monitoring is an important standard fit and this is an item we would like to see fitted to all vehicles. It detects vehicles in an adjoining lane that may be in the driver's "blind spot". It operates on both sides of the car with a detection indicator in each external rear-view mirror. 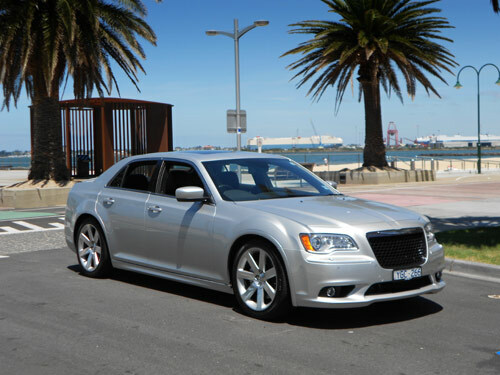 On the combined cycle, fuel consumption of the Chrysler 300 SRT8 is rated at 13.0 litres per 100 kms. City cycle consumption is rated at a whopping 20.4 l/100 km, so expect a figure like this if you do mostly city and suburban running. Highway cycle comes in at a very decent 8.7 l/100 km. The fuel tank capacity is 72.3 litres. CO2 emission rating from the 6.4 litre V8 engine comes in at 303 grammes/kilometre. Best to keep this figure to yourself though. Of course, everyone knows you can put your foot down with a teenager and get no result. There is no uncertainty when you put your down in an SRT8 though. You get an immediate response! And the response will please you. The performance hits the ground via four big 20" aluminium road wheels ('compact' spare). Big Brembo brakes are at the four corners. Standard fare includes cruise control; automatic headlights; reversing camera (very handy with such a big car); front and rear parking sensors; Bi-Xenon HID head lamps with automatic levelling system; 8 way power driver and front passenger seats with 4 way power lumbar adjust; Dual-zone automatic temperature control (ATC) air conditioning; Uconnect Touch 8.4 CD/DVD/MP3 with 8.4 inch touch screen display, auto jack and remote usb port; satellite navigation; Uconnect Phone hands-free calling with Address Sync, Bluetooth® and Voice Command; Rain sensing automatic wiper system, variable intermittent, speed sensitive windscreen wipers; Power windows with driver and front-passenger one-touch auto-up/down; leather wrapped steering wheel with audio, trip computer, EVIC, voice recognition and cruise controls; 4-way adjustable steering column; heated/ventilated front seats; and Rear 60/40 split-folding bench with armrest and cup holders amongst others. 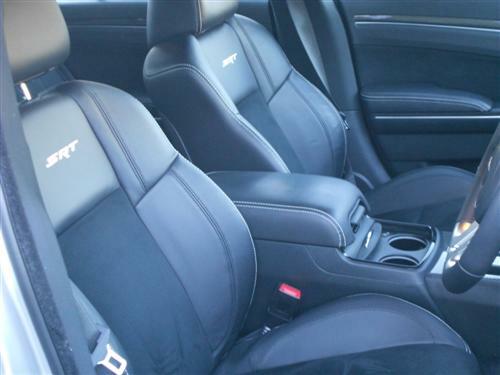 These features make the Chrysler 300 SRT8 a well equipped sedan that provides plenty of luxury. 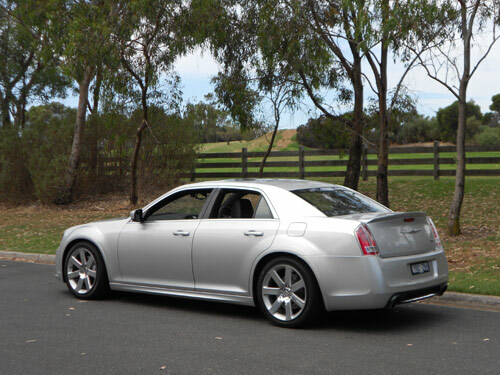 If the V8 is just too much, then Chrysler offer a 3.6-litre V6 (petrol) and a 3.0-litre V6 (diesel) in various trim levels to meet the demands of the marketplace. 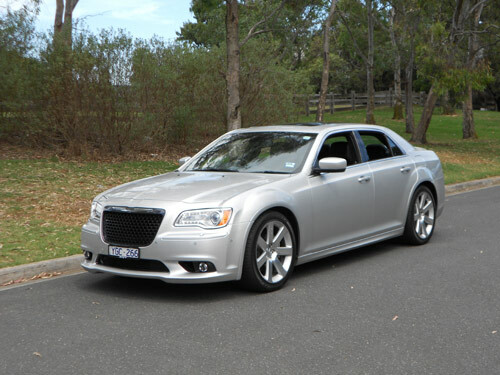 Whilst the market appreciates small and medium sized cars, there are still buyers for a good large car and Chrysler has a broad range on offer with the 300/300C. Chrysler do not recommend towing with the 300 SRT8. 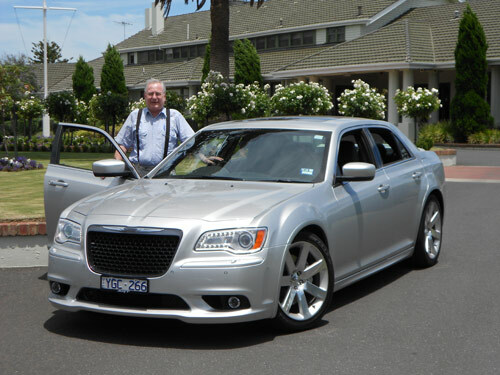 Servicing intervals is 12,000 kms for the big V8-engined Chrysler. The warranty and roadside assistance package operate, with conditions, for 3-year/100,000 km. A very suitable reward for the experienced driver who desires something that is a long way from the ordinary. Something that is not too much in-your-face, yet isn't too conservative. 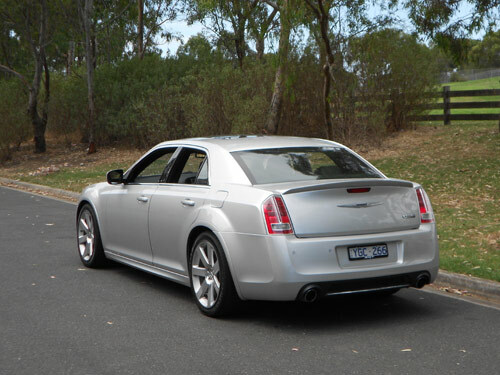 But of paramount concern, motoring memories can be made with the knowledge that nothing has to be proved when you're sitting behind 6.4 litres of HEMI V8 in a Chrysler 300 SRT8. It's more alluring than what you might expect of a big sedan! Long live the muscle car! More Chrysler News ..... here. Chrysler Group News ..... here.